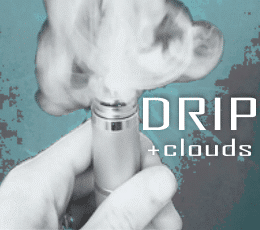 Let me preface this article by saying that I’m relatively new to the world of dripping and rebuildable drip atomizers (RDAs), but most people who drip prefer thicker, higher-VG e-liquid because it’s less likely to flood atomizers, it wicks better and produces huge, satisfying clouds of vapor. Because the flavor is so much more intense while dripping, there’s no need to worry about the muted taste that’s often associated with high-VG e-juice, and most people reduce their PG levels since it doesn’t perform as well in RDAs. You can drip just about anything, but high or MAX-VG seems to be the option preferred by most aficionados, and there are plenty of choices to consider. High VG e-liquid isn’t hard to come by (and it may work great! ), but it isn’t always formulated for dripping, high-powered mods or “sub-ohm vaping.” Here are some products designed specifically for those purposes, containing high levels of VG and engineered for the maximum flavor and cloud production. * PLEASE NOTE: More nicotine is typically absorbed while dripping with an RDA, so e-juice made for dripping / cloud chasing is often only available up to 12mg. Produced by the team at Apollo E-Cigs, Fa-Q is a Max VG e-liquid designed specifically for dripping with rebuildable atomizers. It can be used with tanks and clearomizers, but it’s true flavor shines while dripping at high wattage. Not to be confused with 100% VG or PG-free, MAX-VG refers to an optimal VG blend for maximum performance. It contains between 70-82% VG, depending on the flavor, and is available in 11 unique choices at 0, 3, 6 or 12mg nicotine. Fa-Q Max VG e-liquids are specifically engineered for use in RDAs. They work with many other devices, but their true flavor shines at a higher wattage. These flavors are designed and tested utilizing dripping atomizers. Optimized for dripping directly onto wicks, vaporizing at high wattages and providing enough airflow to generate a huge, flavorful clouds of vapor. Firebrand’s Sub-OHM E-Juice line is specifically designed for use in sub-ohm devices with RBAs or RDAs. It consists of 70-75% Palm VG for maximum vapor and rich, satisfying flavors. It comes in 7 different complex varieties and is available at 0, 3 and 6mg nicotine. Purchase in 30ml glass bottles (with drippers), or upgrade to even larger 60 or 90ml bottles. 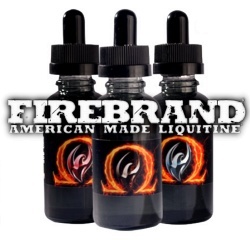 Welcome to Firebrand’s next generation “Liquitine” designed for the rigors of Sub-OHM vaping. After nearly nine months of development, the perfect mix is finally here! 75% VG for perfect clouds that won’t clog up your coils, and flavoring calibrated to stand the test across the sub-ohm spectrum. Join the Resistance! Vista Vapors is more of a “bargain-price” e-juice maker than the other companies listed on this page. They have over 150+ flavors and their standard e-juice starts at just $4.99. Although they may not have the street-cred of an exclusive, craft e-juice company, their new Vista Select “Cloud Series” is designed to compete with the BIG BOYS. Unfortunately, we haven’t been able to test this line yet (review coming shortly), but at 90% VG, it’s ideal for dripping and making clouds. Available in 5 flavors at 0, 3, 6, 12 and 18mg nicotine. Vista Vapors is happy to announce Vista Select as our new premium e-juice line. These amazing blends have been pre-steeped, so stock levels may be limited. Our team has worked diligently on developing this new series we call the Cloud Series. Alloy Blends Electrum is an ultra premium brand of e-juice producing complex, multilayered formulations. They have six unique flavors, with three in their special high vapor “Density” line. These Max-VG products are designed specifically for producing rich, flavorful clouds of vapor and are perfect for dripping. Only available at 3mg nicotine, these are undoubtedly the BEST of the BEST. Alloy Blends was founded to bring the finest handcrafted, USA-made custom flavors to distinguishing consumers. Each flavor is a medley of key notes and tones that compliment and play off each other. Alloy Blends strives to provide not only the best flavors, but the highest quality products on the market. Truly top shelf in all regards. 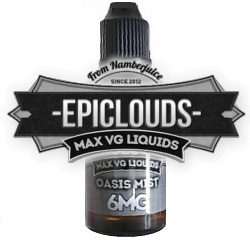 Epiclouds is Namber Juice’s new “Max VG” line of e-liquid designed for cloud chasers. We couldn’t find the actual VG content listed anywhere, but it’s safe to assume it’s high in VG. At the moment they have 6 flavors available at 0, 3 and 6mg nicotine. They come in 30ml plastic bottles, which partially explains the lower cost compared to some products. Epiclouds was created for those vapers that crave the cloud. Those vapers that want more performance from their liquids. Those vapers that need the Epicloud. Epiclouds could be exactly what has been missing from your new build. Teleos is a “craft” e-juice maker that produces complex, unique and flavorful e-juice blends. Their rigorous development process takes into account how each flavor behaves along the power band, and for those looking to sub-ohm vape and produce the most massive clouds of vapor, the Cloud Science line (20/80 PG/VG) is their top-performing e-liquid. Available in four different flavors at 2.5, 6 and 12mg. Experimenting with unlikely and unusual flavor combinations, while attempting to perfect absurdly complex flavors, Teleos tests juice across the entire flavor spectrum. Evaluating each flavor pre- and post-steeping, how each flavor behaves along the power band, and the best atomizers available to bring out each flavor’s subtle notes, are all included in the flavor development process. We couldn’t find much info about Str8Six e-liquid, other than it’s specifically designed for “sub-ohmers” and seems to fit our list perfectly. We can only assume this is another VG-rich blend formulated for dripping and high wattage applications. 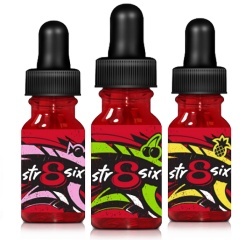 Sold in six unique and complex flavors, Str8Six is currently only available at 6mg nicotine in 15ml glass bottles. The Modzilla e-juice line is sold exclusively at Vapor Beast, consisting of seven different blends, primarily made up of fruit. This high-VG e-juice was produced with the cloud-chaser in mind and is ideal for dripping with rebuildable atomizers. Consisting of 30/70 PG/VG, it’s available at 0, 3 and 6mg nicotine. With the growing popularity of mechanical mods and rebuildable atomizers, dripping lines are all the rage. 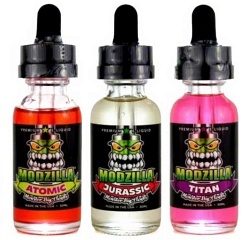 MODZILLA is crafted for those seeking monster big clouds and awesome flavor. All our flavors are made using the finest in natural & organic flavorings found in the USA. What’s your favorite e-juice for dripping or producing HUGE CLOUDS? I tried Blonde from Alloy Blends Electrum before, the flavor is beautiful. White Label Juice Co, is also an honorable mention, their Kiwi Custard, is amazing. Cosmic fog produces massive clouds. Milk & Honey especially! And the flavor is addicting. Big Balls Vape has great taste too. SMAX juice is all 90 vg and there mafia princess and Sammie puff are great flavors.very smooth thick clouds. The first 100% VG juice I tried was Juice Mafia. Not sure if anyone else has tried these before, but I actually enjoyed it very much. Some flavors are more rich than others, and some have menthol to give it a nice cool feel. My favorite are between two of theirs. Either Nimbus or Island Breeze. They have tons of flavors and at a fair price. You can get up to 100 ml of juice for 25 dollars. I’ve enjoyed all of them I’ve tried with the exception of GrapeVape. Give them a try. Hope you enjoy as much I have. I am currently vaping max vg. Clouds of Olympus line of juices using a tfv4 mini tank system with a sextuple head cloud chaser series coil both from smok along with the new xcube2 by smok running at 0.4 ohm / 85 watts … I have awesome flavor pouring through along with thick luscious very dense cloud production ! ! ! ! ! Cutwoods mega melons and unicorn milk are great. So is the reclaim the throne series. Cosmic fog and lost fog are pretty good too.